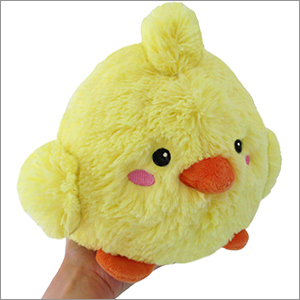 Limited Mini Squishable Baby Chick: An Adorable Fuzzy Plush to Snurfle and Squeeze! The lifecycle of gallus gallus domesticus is filled with delicious milestones! At the beginning of its life, eggs make possible the cakes, quiches, and huevos rancheros we so dearly love! And at the end of it, we're delighted to fire up the rotisserie or prepare the wing sauce! Yet in between we have the humble Chick, and all culinary plans go out the window! We become awestruck and protective, gently holding these little yellow fluffballs in our cupped hands, whispering near-gibberish like "You're such a wubba wubba wittle cuteypoo! Yes you are!" And so on. Only something as overwhelmingly gentle, adorable, and fuzzy as a baby Chick could overpower our appetites and turn us into puddles of harmless admiration! Hug a Chick, and voluntarily give up your place on the food chain for a few minutes! 7 squishy inches of coq awwwwww vin! All new polyester fiber, ages 3 and up only! I got this little guy for the Great Squish Exchange and I love it! !